For her part, Wolf is unapologetic about the response her performance received, tweeting “Thank you!” to a statement made by former White House Press Secretary Sean Spicer calling her comments “disgraceful”. The 25th annual White House Correspondents Garden Brunch brought together Washington politicos and Hollywood A-listers to recognize veterans and their contributions to our democracy including SAP NS2 Serves, a non-profit dedicated to helping veterans by providing valuable IT training and employment assistance at absolutely no cost to the veterans. Congressman Don Beyer (D-VA) joined Testoni on stage at the Garden Brunch to present this year’s NS2 Serves graduates with the Garden Brunch Champions of Freedom Award. In just four years, NS2 Serves has celebrated ten graduating classes totaling over 200 students, giving graduates and their families the benefits of quality, skilled-based employment in technology fields. Every graduate from this year’s class has been hired by Deloitte. The Garden Brunch is proud to support NS2 Serves and its commitment to providing skills training and high-tech jobs to veterans. The annual White House Correspondents’ Garden Brunch brings together Hollywood stars, politicians, and of course, the brightest lights of Washington media, and this year’s 25th anniversary was no different. Stormy Daniels’ attorney Michael Avenatti was spotted at the brunch as well as celebrities like HBO Ballers star Richard Schiff, Gloria Calderon Kellett showrunner Netflix’s One Day at a Time, and The View co-host Sunny Hostin. Among the Trump administration and White House officials in attendance were Senior Advisor to the President Kellyanne Conway, Deputy Press Secretary Hogan Gidley, and former White House Press Secretary Sean Spicer. Pollster Frank Luntz, political advisor Bill Knapp, Heather Podesta, and American Conservative Union head Matt Schlapp and his wife, White House Director of Strategic Communication Mercedes Schlapp were among the politicos seen at the brunch. The bipartisan crowd featured members of Congress from both sides of the aisle including Representatives Darrell Issa, Debbie Dingell, Don Beyer, Joaquin Castro, and John Delaney. Government officials included Virginia Lieutenant Gov. Justin Fairfax, DC Mayor Muriel Bowser, DC Councilman Jack Evans, DC Senator Paul Strauss, and Dr. Carla Hayden, the Librarian of Congress. 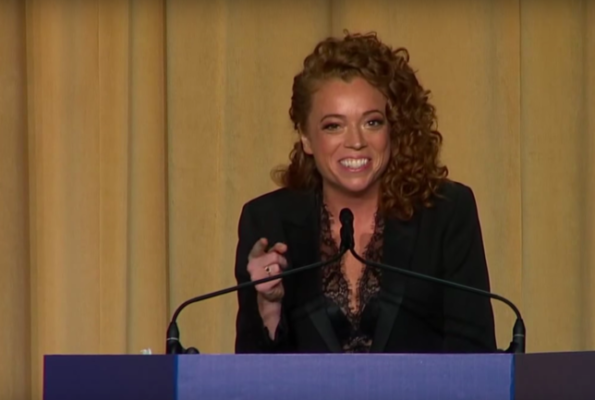 Comedians Jordan Klepper, the host of Comedy Central’s “The Opposition”, and RJ Fried, the executive producer of “Our Cartoon President”, a segment of which made it into the program at the White House Correspondents Dinner, were also in attendance. 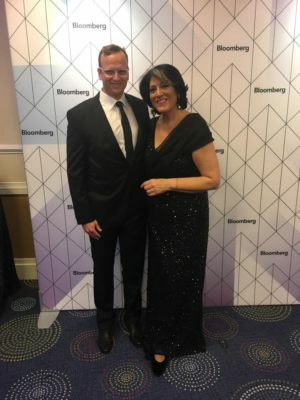 News Leaders included Fred Ryan, publisher of the Washington Post, Craig Gordon, Bloomberg DC Bureau Chief, Sam Feist, CNN Bureau Chief, and Andrew Morse, President of CNN Digital. A handful of TV hosts including ABC Correspondents Bob Woodruff and Juju Chang, Brian Stelter, Don Lemon, MSNBC analyst Heidi Przybyla, Washington Post reporter and host of PBS Washington Week Robert Costa, and MSNBC hosts Ali Velshi and Stephanie Ruhle joined the fun. Making the rounds were media stars Margaret Talev, the veteran Bloomberg White House Correspondent and WHCA President, MSNBC’s Peter Alexander and his wife Alison Starling, CNN Political Director David Chalian and CNN reporters Jeff Zeleny and Jim Acosta, Pulitzer Prize-winning journalist from the Washington Post Philip Rucker, ABC White House Correspondent Jonathan Karl, The Atlantic’s Steve Clemons, Politico’s Daniel Lippman and Anna Palmer, MSNBC national security analyst Jeremy Bash, Fresh FM Tommy McFly, and Defense One’s Kevin Baron. Notables included MPAA President Charles Rivkin, President of the Corporation for Public Broadcasting, Patricia Harrison, Ted Olson and Lady Booth Olson, General John Campbell, Abbe Lowell, Valerie Jarrett, Ambassador Lloyd and Ann Hand, Sally Quinn, The Wing co-founder Audrey Gelman, Executive Director of Wikimedia Katherine Marler, David Adler, Robert & Elena Allbritton, Ryan Williams, Facebook’s Erin Egan and Rachel Whetstone, Zach Leonsis, co-owner Monumental Sports, Washington Wizards and Ed and Deborah Lerner Cohen, co-owners of the Washington Nationals, and Tina Tchen of the Time’s Up Legal Defense Fund. This year’s Brunch co-hosts were Mark and Sally Ein, who own the Beall-Washington House where the brunch took place, Greta Van Susteren and John Coale, Tammy Haddad, Hilary Rosen and Megan Murphy, Kevin Sheekey, Fred Humphries, Franco Nuschese, and Fritz Brogan. 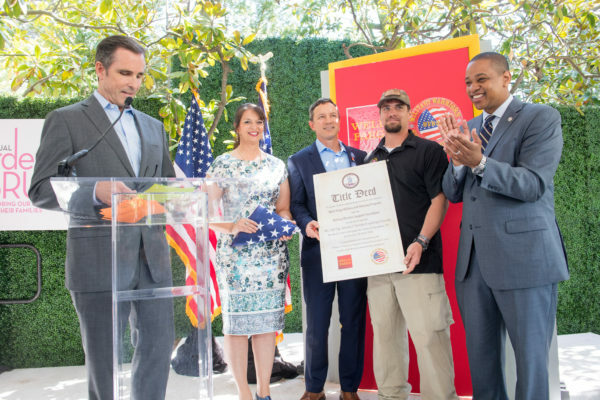 Bob Woodruff, Andrea Dellinger, Jerry Quinn, and LT Gov Justin Fairfax present Dominic with the official deed. 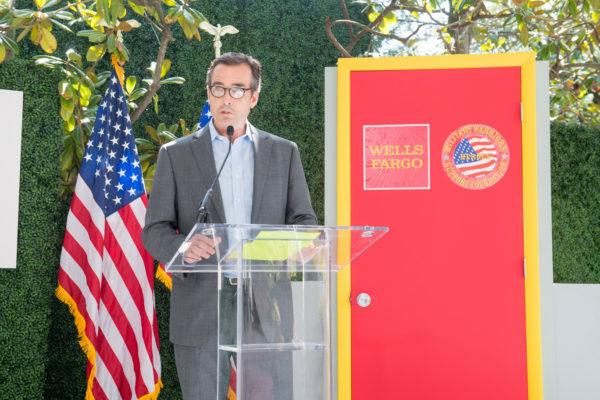 This year’s White House Correspondents Garden Brunch was full of surprises and the biggest came when ABC News Correspondent Bob Woodruff partnered with Wells Fargo to present Ret. Army Staff Sergeant Dominic Perrotte with a 100% mortgage-free house! Perrotte, who completed 3 tours of duty in Afghanistan and Iraq and was wounded in 2012 when his vehicle was struck by a roadside bomb, was awarded the home after completing the Wells Fargo and Military Warriors Support Foundation’s Homes4WoundedHeroes’ three-year financial mentoring program. Woodruff awarded Perrotte with an Ann Hand eagle pin, which is worn by Congressmen, Ambassadors, and military service members. Woodruff even invited Perrotte to attend the White House Correspondents Dinner as his guest! Virginia Congressman Don Beyer and Virginia Lieutenant Governor Justin Fairfax were there to congratulate Perrotte upon accepting the deed for the home, which is in Hampton, Virginia. Showtime’s Our Cartoon President made a special appearance at the White House Correspondents Dinner on Saturday, April 28th to serenade the New York Times’ Maggie Haberman. The segment also featured cartoon versions of MSNBC’s Rachel Maddow, CNN’s Wolf Blitzer, and White House Correspondents’ Association president Margaret Talev. Along with producers RJ Fried and Stephen Colbert, “Our Cartoon President” is executive produced by Chris Licht, the executive producer of “The Late Show with Stephen Colbert” and Executive Vice President of special programming at CBS. Washington’s top names, media icons, politicos, and celebrities descended upon Katharine Graham’s Beall-Washington House, owned by brunch co-host Mark Ein and the location for scenes in Steven Spielberg’s The Post, for the 25th annual Washington Correspondents Garden Brunch to mingle, grab goodies from the donut wall, and most importantly, to honor the military service members who give their lives to protect our liberty. Tammy Haddad, who started the Garden Brunch in her backyard 25 years ago, kicked off the proceedings by bringing out longtime Bloomberg correspondent and this year’s White House Correspondents’ Association President Margaret Talev who reminded folks that the reason they all gather is to protect the First Amendment and celebrate the hard work of journalists. Hilary Rosen took the stage to thank a special Garden Brunch guest, Former US Navy Commander Everett Alvarez Jr., who earned a Purple Heart after being the first US pilot shot down over North Vietnam. Alvarez Jr. spent eight years as a prisoner of war, one of the longest periods in American military history. 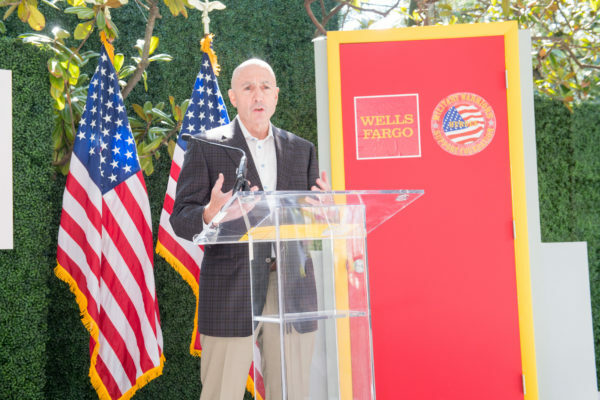 Wells Fargo teamed up with SAP NS2 Serves and Garden Brunch hosts Tammy Haddad, Hilary Rosen and Megan Murphy, Mark and Sally Ein, Fred Humphries, Mark Testoni, Kevin Sheekey, Fritz Brogan, Franco Nuschese, and Greta Van Susteren and John Coale, to honor Ret. Army Staff Sergeant Dominic Perrotte to award the veteran, who completed 3 tours of duty in Afghanistan and Iraq and was wounded in 2012 when his vehicle was struck by a roadside bomb. 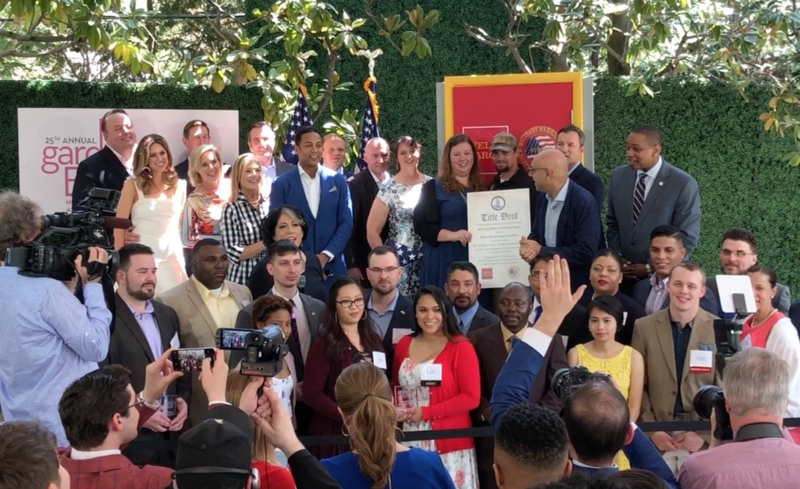 As part of Wells Fargo’s commitment to helping veterans, they have partnered with the Military Warriors Support Foundation’s Homes4WoundedHeroes to award Perrotte and other combat-wounded gold star families with a 100% mortgage-free home in Hampton, Virginia- yes, a home! Virginia Lieutenant Governor Justin Fairfax praised Perrotte’s service and opened the frame door where Jerry Quinn, Wells Fargo’s Military Affairs Program Manager, awarded Perrotte the deed to the house along with Andrea Dellinger with the Military Warriors Support Foundation, who presented Perrotte and his wife Kayla with a flag to fly in front of their new home. ABC News Correspondent Bob Woodruff, who was wounded while covering the frontline in Iraq in 2006, introduced Perrotte and awarded him with an Ann Hand eagle pin, which is worn by Congressmen, Ambassadors, and military service members. Woodruff even invited Perrotte to attend the White House Correspondents Dinner as his guest! 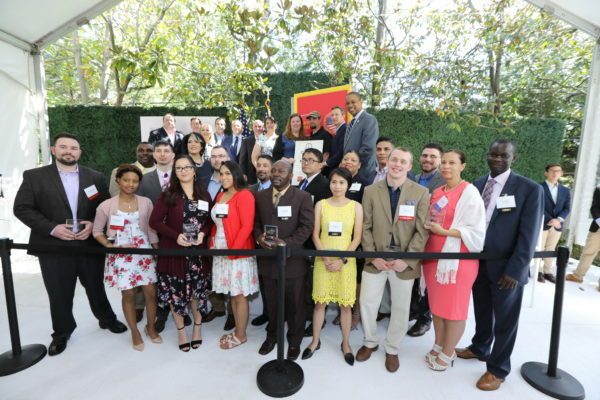 SAP NS2 Serves President Mark Testoni brought the 17 graduates from this year’s NS2 Serves program, which places vets in an intensive training program to place them in high tech jobs, to the stage where they each received the Garden Brunch Champions of Freedom Award. The bipartisan crowd included administration officials Kellyanne Conway and former White House Press Secretary Sean Spicer, Representatives Darrell Issa, Debbie Dingle, Don Beyer, and notables Ali Velshi, Ambassador Roy Hand, Alison Starling, Ambassador Charles Rivkin, Anna Palmer, Audrey Gelman, Bill Knapp, Brian Stelter, Chrys Kefalas, Daniel Lippman, Don Lemon, Dr. Carla Hayden, Franco Nuschese, Frank Luntz, Fred Humphries, Fritz Brogan, General John Campbell, Gloria Calderon Kellett, Greta Van Susteren, Heather Podesta, Hilary Rosen, Jack Evans, James Hong, Jeremy Bashd, David Adler, Jill Zuckman, Joaquin Castro, John & April Delaney, John Coale, Jonathan Karl, Jordan Klepper, Juju Chang, Kevin Baron, Laura Gray, Lt. Governor Justin Fairfax, Madchen Amick, Margaret Talev, Mark & Sally Ein, Mark Testoni, Matt & Mercedes Schlapp, Mayor Muriel Bowser, Megan Murphy, Megan Smith, Michael Avenatti, Richard Schiff, Robert & Elena Albritton, Sally Quinn, Stephanie Ruhle, Steve Clemons and Andrew Oros, Amy Weaver, Erick Kuhn, Steve Howey, Sunny Hostin, Tara Setmeyer, Ted Johnson, Ted Olson, Tekedra Mawakana, Timothy Lowery, Tina Tchen, Tommy McFly, Valerie Jarrett and Laura Jarrett, and Zach Leonsis. On Saturday, April 28, the 25th Annual White House Correspondents’ Garden Brunch will honor our military veterans who have served the nation at the highest level. We owe our veterans a great debt, and one important way to give back is to ensure they have the job skills and financial independence needed following their military service. Saturday’s event will highlight Wells Fargo’s veteran home donation program and NS2 Serves’ training and hiring programs. The White House Correspondents’ Garden Brunch is hosted by Tammy Haddad, Hilary Rosen & Megan Murphy, Fred Humphries, Mark & Sally Ein, Mark Testoni, Greta Van Susteren & John Coale, Fritz Brogan, Franco Nuschese, and Kevin Sheekey. Follow the conversation on social media at #GardenBrunch, @WHCInsider, @WellsFargo, @NS2Serves and #NS2ServesVets. There won’t be a shortage of ways to have a good time for the journalists, politicians and celebrities in Washington, D.C. this weekend for the 2018 White House Correspondents’ Dinner. Following is a running list of events scheduled to take place. Representatives from Wells Fargo will attend the 2018 White House Correspondents’ Garden Brunch. The event will highlight their efforts to donate mortgage-free homes to combat-wounded veterans and Gold Star families through the Military Warriors Support Foundation’s (MWSF) Homes4WoundedHeroes program. A special announcement will be made on stage during the brunch. As part of the Homes4WoundedHeroes program, veterans and their families enroll in a three-year financial literacy and family mentorship training program through MWSF and receive the deed to their home upon successful completion. Mentors help them make budgets, manage their finances, and get ready to become homeowners, and also help navigate the many challenges of transitioning to life outside the military. 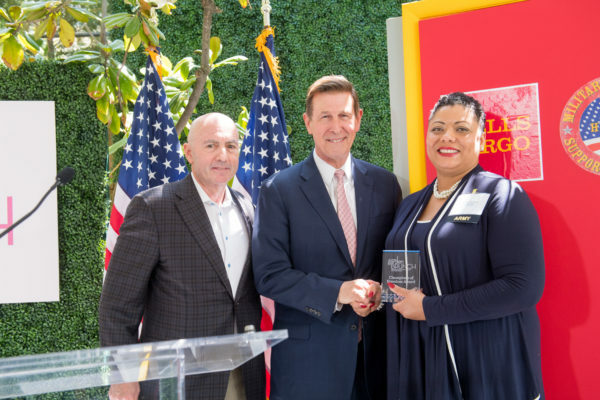 To date, Wells Fargo has donated over 350 homes, valued at $55 million, to veterans and Gold Star families in all 50 states. Watch the following video to learn more about the program.